Boutinot recently purchased some extra vineyards in Cairrane, which came with some outbuildings that they have converted into accommodation. It is in great demand, not only with their staff, customers but also their international arms ( from Russia to the USA). We are very lucky to have been offered accommodation by Boutinot in what they modestly call a gite, with a swimming pool, BBQ and surrounded by vines. This will make the ideal base for exploring the surrounding areas of Sablet, Seguret, Rasteau, Gigondas and Chateauneuf-du-pape. Seguret, village lies at the foot of a hill topped by the ruins of its feudal chateau. Séguret is one of the official “most beautiful villages in France”, and thoroughly deserves this distinction. As soon as you arrive, you will be bowled over by the charm of this village, with its typical Provencal atmosphere and medieval character. Cairanne has two quite distinct parts – the old village with a population of 80 – high on the top of the hill and the village proper below with a population of 850. Most of the buildings in the old village date from the eighteenth century except the old ramparts which date back to the 12th century when first the Knights Templar and then the Knights Hospitaller lived in the here. These old villages bring to life the image of donkeys pulling their loads down the narrow cobbled streets. Normally there are flights to Montpellier and Nimes but they are not available in 2019 so we fly to Marseille on an afternoon flight then a 90 minute drive to Cairanne, our base for the next 4 nights. We explore the old villages near Cairanne of Sablet and Seguret then returning to examine the Boutinot winery at Cairanne.. The photo to the left is of Seguret village, which is classified as one of the ‘most beautiful villages in France‘. Seguret old town is entered by a cobbled street under an old stone archway, the Porte Reynier. Inside the gateway you will discover a very picturesque historic village with a great deal of character. Pictured on the left is the winemaker Julien at the Boutinot Cairanne winery. Bizarrely they selected the bee as an emblem in 2010. Since those days, the Cairanne area has been upgraded to the same staus as Chateauneuf-du-pape. We will be able to taste their wines. Their flagship wine from Cairanne ‘La Côte Sauvage’ is characterised by finesse and a finely-grained texture, due in part to the famous ‘argilo-calcaire’ of our hilltop vineyards such as La Pauline ( she gets everywhere) and Les Six Terrasses, slow winemaking methods and gentle maturation in old French oak of different barrel sizes. In the evening weather permitting we will have a BBq cooked for us. Its Chateaneuf-du-pape day. A short 30 minute journey to one of their best houses Chante Cigale and taste their wines. Chante Cigale means singing cicada (a type of grasshopper/cricket). Consisting of 41 hectares, the domaine benefits from old vines, some of which are veritably ancient at over 100 years old. The property has been in the family since the 19th century and is currently run by Alexandre Favier who assumed the reins at the ripe old age of 20! His father let him make wine one year and he had to admit his son was better at it than he. Also Pauline noticed he was very good looking! Alexandre is lauded by notable journalists including Steve Danzier and Jancis Robinson for his deftly-made and reasonably-priced wines. The reds are magnificent examples of great Chateaneuf-du-pape but the whites are so overlooked and offer better value. The photo above shows the famous pudding stones that cover the Chateauneuf vineyards. After checking the market out in Cairanne, we drive for 10 minutes to Gigondas, see their winery and sample the wines. Inhabited since prehistoric times, colonised by the Romans and seigneury of the Princes of Orange in the Middle Ages, Gigondas is a village at the foot of the Dentelles de Montmirail in the Haut Vaucluse. There are several hypothesis about the origins of its name: it comes from gignit undas which means “risen out of the waters” or maybe from Jucundas, a legionnaire and first owner of the place. Whatever it may be, its Roman name “Jocunditas” means joy or jubilation, very appropriate for this little village with a population of 700 which gives itself over to the cultivation of grapevines and the pleasures of wine. Again we dine locally. We leave Cairanne heading south to Nimes where we call in at Chateau L`Ermitage for a tasting. Traces of the vineyard dates back in the 12th century. L’Ermitage of Costières produced wine for the pilgrims of Saint Jacques de Compostela. The first cellar of Château l’Ermitage was built early 1800.The vineyard has a southern exposure, overlooking the Camargue. In summer it enjoys a marine micro climate with a sea breeze. We will then be only 60 minutes from the airport for the 19.00 return flight to Manchester. We really are excited about this trip and we look forward to sharing our discoveries You might want to bring a large suitcase to cover your purchases… wine oils, cheese etc. The cost of this trip will be £1395.00, as there is an extra day and 2 more meals than normal. Bearing in mind that this will include flights, transport, all meals and wines. There would be a £95 supplement for a single traveller. We would like a 25% deposit on booking and the balance 6 weeks before leaving. There is no travel insurance included in this trip. Please find details below of our trip to Malaga and its wineries for April 19. The restaurant scene in Malaga has risen to great new heights incorporating the old and new. Malaga also is the new “in Place”. In mid May we will be repeating our trip to Piedmont at Il Cascinone and of course featuring trips to Barolo and Barbaresco. We are awaiting confirmation of dates before we release the itinerary. In October, we visit Tuscany and will visit wineries Uggiano and Capezzana with 2 nights at the latter and the first in the charming town of Volterra. Again more details will follow later. Andalucía is known for sea, sun and even tapas but not, so far, its fine restaurants. Now it’s rapidly changing and on a par with the gastronomic powerhouses of Catalonia and the Basque Country. Málaga has fantastic sardine and boquerón [anchovy], amazing shellfish, tropical fruits like mango and avocado. It has the last cane honey [molasses] to be produced in Europe. Despite all this, both city and region have been undersold for decades. Part of the blame lies with years of package tourism that have seen the city of Málaga as the “airport place Málaga. Malaga is the food hub of southern Spain, in terms of produce and dining: “It has the most important goat-breeders in Europe. The French take 95% of the milk to make their cheeses. Andalucía produces half of the world’s olive oil. Know where it all ends up? Shipped to Italy for bottling as Italian extra virgin. We have selected a great hotel, Room Mate Larios. Room Mate Larios in Malaga city centre. This hotel with balconies overlooking the pedestrian street Calle Larios, the best shopping parade of Malaga, is a short walk from the Picasso Museum, the Carmen Thyssen Museum, the Cathedral, Picasso’s birthplace, the Alcazaba, the Castle of Gibralfaro and of course of the typical restaurants and bars in town. Most visitors to Malaga go to the Picasso museum and his birth house, as the painter is the most famous son of the city. There is also a first rate art museum now which focuses on Andalucian art – the Museo Carmen Thyssen. Other museums, include the fascinating Museo del Vidrio y Cristal de Malaga, run by Professor Ian Philips showing the history of glassmaking , Russian State Museum Collection St. Petersburg featuring Unique Russian art , the quirky Automobile and Fashion Museum, Museo de Malaga showing the evolution of Malaga, ,Museo de Artes y Costumbres Populares with the evolving change in lifestyles of Spain, Centre Pompidou Malaga and finally Museum of the Imagination . Plus wonderful churches, parks and the newly developed marina. Tons and tons from Bimba & Lola, Adolfo Dominguez, Camper and Pikolinos shoes, the huge El Cortes Ingles. Down the side streets are small independent shops setting up showing their individuality in clothes jewelry and ceramics. We have found some amazing restaurants in Malaga with the help of our contacts. We are so looking forward to sharing our finds with you! Wonderful, modern cuisine with outstanding wines. Bodegas Dimobe , This winery began life as a bakery but the owner found the early starts too demanding and decided to turn it into a small winery. They used to make just a sweet Moscatel from bush vines. 60 years later these old vines have matured and are making intensely flavoured wines. They have since branched out making dry whites and red wines. Also,they now make a dry Moscatel and recently released a sparkling wine. The winery is set in the charming village of Moclinejo and offers 360 degree views from this hilltop site. Moclinejo itself is a pretty whitewashed village. This is a smaller winery run by two brothers, only making 3 wines, 2 reds and 1 white around the town of Alora. There is a very floral dry aromatic Moscatel and then 2 reds based Cabernet, Shiraz and a little Merlot. The 2 brothers have taken a modern approach to the winery by planting the vines closer to each other, growing the vines on high trellis to avoid some of the ground heat radiating upwards. The wines are stylish and full flavoured. The crianza is aged for 12 months in oak and their top wine 18 months. Finca la Torre is located just 15 minutes away from the lively centre of Antequera and is completely surrounded by 376ha of olive groves, fields, pine forest and flanked by two hill ranges. This exceptional location offers extensive views that sweep from south to west. This privileged secluded location has one km long palm-lined avenue that offers spectacular sunsets and sunrises. This oil from the Picuda variety produces a range of flavours with floral, almond, green pepper, bitter almond and black pepper. It is a multi-award winner: winner of the Mario Solinas Quality Award of the International Olive Oil Council for 4 years in a row in the intense category -highest score of 99 points from Flos Olei in 2018, the international olive oil guide. Day 1 Tuesday We fly out on an early flight from Manchester to Malaga and then have a short 45 minute journey to Alora . We will taste the wines at Perez Hildalgo and then lunch locally. We return to Malaga and check in at the hotel, leaving a few hours spare .That evening we have a short walk to our restaurant. We go to Bobadilla, near Antequera to taste the fantastic award winning olive oils from Finca de la Torre. We lunch in Antequera at their best restaurant. Pictured are Croquettes of mushroom with beetroot mayonnaise. We return to the hotel and will have some spare time before we meet for the evening meal. Day 3 Thursday This is a busy day, we drive up to the hills of the small village of Moclinejo to visit the museum and taste the wines of Dimobe. Afterwards we drive to the coast to lunch on the beach. We have just discovered this gem of a restaurant. The anchovies cooked in a lemon tempura are fantastic. A short drive back to Malaga again leaving a 3 or 4 hours recreation time before dining in one of our favourite restaurants with a vast selection of wines. Day 4 Friday A free morning before we meet for lunch and then leave for a tea time flight back to Manchester. We really are excited about this trip and we look forward to sharing our discoveries with you. The 4 star hotel and the restaurants are of a very high standard. You might want to bring a large suitcase to cover your purchases… wine oils, shoes etc. The cost of this trip will be £1295.00. Bearing in mind that this will include flights, transport, all meals and wines. There would be a £95 supplement for a single traveller. We would like a 25% deposit on booking and the balance 6 weeks before leaving. Mention Cordoba and everyone says “Ah The Mezquita”. It is true that this mesmerising Mosque/Cathedral is an incredible mixture of Moorish and western architecture but it tends to overshadow the rest of Cordoba. Admittedly we did the same, 12 years ago and when we visited last month it was like discovering a whole new city. Exquisite, antique tiling everywhere. Romantic Andalucian patios and courtyards with narrow mosaic streets. Breathtaking palaces, churches and buildings. The most admired mosque in the world. The gardens are so delightful. The light and shade is picture perfect. An idyllic setting to just sit back and reflect . We walked across the ancient Roman bridge and looked back on the city. It was like a film set, so dramatic and beautiful with the backdrop of the Alcazar and Mezquita . It was a lovely walk alongside this striking river. So many areas, to see and discover. So many places, to eat. We have found the best. Lots of walking, map reading and tasting. We have chosen a good variety of modern and traditional cuisine. We think you will be very pleased with our selections. We will have a tasting in the hotel and visit Alvear in Montilla. The oldest and proudest winery of the region making a selection of wines and brandies. This sprawling bodega has a huge capacity to age their wines. The guide was so informative and enthusiastic we though she was part of the family She gave us the full history of the firm with its lengthy connections to the U.K. We then taste a few wines with tapas to complement them. from amazing patios to palaces, gardens, churches, posadas – so beautiful. Art, culture and history all around Cordoba, All close to one another. We saw 3 museums in 2 hours. You will have plenty of time to see our favourite ones and more. It is such a special characterful place. So many patios are open to the public. with more incredible gardens and plantings. We will arrange all flights and transport. It will be an early morning flight from Manchester and we will meet you at the arrivals hall at Malaga airport. We then take you to our house in Antequera for lunch. It is a short 50 minute journey. After lunch we have another hour`s drive to Cordoba to check in to our hotel. On Friday for our return we drive to the beach and dine there before an evening return flight to Manchester. We fly out on an early morning flight where we pick you up outside Malaga airport. We then have under an hours drive to our house in Antequera where we lunch with cava wine and obviously food. Suitably refreshed we have another hours drive to Cordoba where we check in tour hotel NH Collection Amistad Córdoba www.nh-hotels.com/NH_Amistad_Cordoba. That evening we walk down to the river and have meal outside watching the world pass by. There is no further driving for the next 2 days. The visit is completed with one of its main attractions: twelve courtyards and the garden, each with a distinct personality that enhances the tour with many different sounds, colours and aromas. The interior of the house and its courtyards integrate seamlessly, giving the palace original harmony. The role of the courtyards offers the possibility to enjoy a changing environment, providing different visions and sensations. It is rare in Spain to find this combination of an aristocratic house to see its interior and the marvellous 12 patios. This palace has evolved over 5 centuries. After this amazing mansion/palace we take you for lunch nearby. Day 3 Thursday 31st May. Again after breakfast we take our Tardis to the Posada del Potro. It is quite frightening the images of this establishment in the old days. The medieval meeting place, on the south side of the square, was a known haunt of adventurers and a favourite of Cervantes – he mentions it in Don Quixote. The writer lived in Cordoba as a child – his family moved there in 1553 from Valladolid, and stayed until 1557, living in a street called calle Sillerias, now called Romero Barros. He probably also stayed at the Posada. The inn, a typical corrala – two floors built around a narrow cobbled courtyard, the upper floor with a gallery and wooden pillars and balconies – has now been turned into a centre for the study of flamenco, the Centro Flamenco Fosforito, named after the famous singer Antonio Fernandez Diaz Fosforito ( who could have been a prototype for Elvis Presley). Then, round the corner for lunch. Again in the afternoon there is time to explore more of Cordoba until 20.45 when we stroll out to a small family run restaurant where the wife cooks and husband does the front of house. Great food and so friendly. It may be the last day but we have packed an awful lot into this. We check out of the hotel and have a 20 minute drive to Montilla to visit Alvear the oldest winery in the region. Jancis Robinson writes Although it has the same chalky white soils as sherry country, Montilla-Moriles is higher and has a more extreme climate, naturally producing much riper grapes. It makes various wines similar to but slightly softer than the common sherry styles – in fact the name of Amontillado sherry means ‘in the style of Montilla . The cost of this trip will be £1095.00. Bearing in mind that this will include flights, transport, all meals and wines. There would be a £95 supplement for a single traveller. We would like a 25% deposit on booking and the balance 6 weeks before leaving. John & Pauline Booth, Mobile 07938 143 429 E-mail jbw27@btinternet.com or www.andalucia-unwrapped.co.uk. We are planning a trip to the vineyards and scenery around Stellenbosch in October 2018. This will be their spring and it is a super time to visit S. Africa. We will show you around for the first week featuring stylish hotels, great vineyards and fine restaurants. Then there is the option to stay on – to explore the garden route or to enjoy a safari, etc or to return to Manchester. We start with visiting Table Mountain, recently named one of the new 7 wonders of the world, it is the incredibly iconic mountainside that rises prominently over Cape Town. The cable car journey ( more details on http://uponarriving.com/2016/10/25/visiting-table-mountain-cape-town-south-africa/) offers fantastic 360 degree views . The photo options are endless. We taste wine at one of the oldest winery in S. Africa, Klein Constantia, where we also lunch. In the afternoon, following this we have a short journey to Kirstenbosch national botanical gardens. These gardens are absolutely beautiful (especially in their spring). This World Heritage Site is packed not only with indigenous plants but numerous birds. The fynbos has its own charm and the sights and smells are really special . That evening we dine in Constantia. A 75 minute drive to Cape Point, people commonly refer this as where 2 oceans meet. On some days there is even a colour difference. We take the vernacular to the top for the best viewpoint. We return to Noordhoek, where we stop for a tasting at Cape Pont vineyards cpv.co.za, then lunch at The Food Barn www.thefoodbarn.co.za and possibly a walk on the beach. That evening we dine near the hotel. We check out of the hotel and head south east to Waterkloof estate www.waterkloofwines.co.za. This is the winery that Paul Boutinot bought, to make the best wines he possibly could. He also built a very highly regarded restaurant with great views of False Bay . The estate has 56 hectares under vine and Tim Atkin’s Cape Classification currently ranks Waterkloof as 5th Growth level. With production around 165,000 bottles per year, Waterkloof make “honest wines” from their unique biodynamic coastal site. Respect for nature, traditional winemaking practices and minimal intervention are all key to their success. After a tour of the winery and tasting his fabulous wines, we will have lunch there. We check in at the nearby Hotel Lalapanzi https://www.lalapanzilodge.co.za. It may be possible to have a relaxing brai (BBQ) in the lovely gardens that evening. We drive to the coastal town of Hermanus, which is the best land site for watching the whales and dolphins. Fortunately, at this time of the year the whales are calving. So they come closer inland into calmer waters. We head off to another winery Newton Johnson and force ourselves to taste some more wines. The coastal Upper Hemel-en-Aarde valley has one of the coolest climates in South Africa, with maritime winds moderating the temperature, and a diversity of granite, quartz and clay soils. They make excellent Pinot Noir and a pretty good Chardonnay. They also have a very respectable restaurant. It is built on a mountain slope, so has a spectacular view of the valley and views of the sea. We check out of the hotel and head off to Stellenbosch and visit the Zorgvliet winery . This is the latest acquisition by Boutinot wines. They have a good sized winery which they will take us around and then we will have lunch and sample some of their wines.There is some stylish accommodation and we will spend our last night here. We will dine in Stellenbosch . After breakfast we check out of our hotel and head for the airport. This is the end of our tour but if you wish to stay on we can either leave you at the hotel or take you to the airport for either a flight home or to pick up a hire car. This is the lengthiest trip we have planned and also our flights are over a £1000. We have selected the shortest flight time and in the best possible hours . There are cheaper flights via Istanbul, longer flights via Dubai or Doha, but we have selected a flight leaving at 06.00am arriving Cape Town at 21.20 with a stop at Amsterdam. Should any better priced flights turn up before we book, there would be a price reduction. There would be a £95 supplement for a single traveler. We would like a 40% deposit on booking and the balance 6 weeks before leaving. Please let us know if you may be interested in this trip. We do not envisage booking this trip till June 17. Then we would give you exact dates for the flights. Please contact us if you are interested and we will put you on the list. This will be the usual small group with a maximum of 14 people. We fly from Manchester to Malaga arriving before midday. We travel to our house in Antequera for a welcoming lunch. Then there is a 3 hour pleasant, relaxing drive to Cadiz. There will be a stopover along the way for you to stretch your legs or seek refreshment. We have booked a hotel in the old town that is very convenient for bars,shops and churches. The Hotel Francia y Paris is situated in a beautiful square with a few bars and cafes . That evening we dine, just round the corner, in a modern restaurant and tapas bar that many people consider to be the best in Cadiz. We have a late start to the day departing at 11.00 to visit our favourite winery in Spain, Fernando de Castilla.is only 50 minutes away. This bodega, founded by Jan Petersen ( pictured) has gone from strength to strength. Not only are his sherries, the best in the world but the lunch he provided was exquisite. The traditional setting of this house and the dining room, was matched by the food and wine, making this a highly enjoyable experience. Even if sherry is not your favourite tipple, when matched with food it`s so good. In Europe sherry is always dry. We can guarantee that this venue and dining experience you will always remember. We return that evening to dine in the old, fishermens quarter of Plaza de Tio. This a beautiful row of old cottages with numerous tables outside. As you would expect the emphasis is on fish and seafood but there is also a very tasty stew of rabo de toro and other meat dishes. This quarter or barrio is very friendly and accommodating. Round the corner is a bar that reeks of atmosphere and history. As a friend of ours would say.”You could settle in here”. This is so popular with the locals and everyone spills out on to the street, creating a real, street atmosphere. There is more time to relax or shop and we meet again in the evening for a restaurant that specialises in red tuna. We tried a selection and were hard pressed to choose between the dishes. They were all that impressive. This may be the last day but we have packed an awful lot into this Thursday. We leave the hotel for a 60 minute drive to a winery that is producing some fine wine, Bodega Etu-vinos ..This is the most southern vineyard in Spain. It has great views of the Atlantic and its breezes have a beneficial cooling effect on the vines. This is a small winery and everything is done by hand. Then we leave for the most beautiful village of Vejer. Vejer is like a Spanish Ludlow. Every cafe restaurant is serving high quality food. The stunning castellated town is a magical place to explore, its quiet cobbled streets meandering through a charming jumble of secret corners, hidden patios and delightful houses. Great care has been taken to preserve this beautiful town Hidden behind ancient walls is a magnificent church, and in general visitors will barely find a hint of plastic or a trace of the 20th Century. The town square, shaded by vast palm trees, has a wonderful old fountain with traditional ceramic Andalusian frogs which spout water high into the air, thus forming a fountain. We lunch overlooking this square.. We leave at 3 to have a leisurely drive back to Malaga airport for the evening flight to Manchester. We are convinced that this has all the hallmarks of being a great trip. Should you be considering it, we will advise you to book early as the hotel has a limited number of rooms. Puglia, the remote heel of Italy’s boot, dramatically combines fairytale cottages (trulli), Baroque churches and traditional cuisine. Italian families head for the coast every year in July and August, but handsome Baroque towns such as Locorotondo and the engaging Lecce see only a handful of visitors each day. We take an afternoon flight from Manchester to Brindisi arriving around 8pm and then we have a 40 minute drive to our hotel in Lecce. Our hotel is set in the historic centre, nestled between palaces, squares, churches and intriguing alleys. Set in a former 18th-century palazzo, this boutique hotel Patria Palace Lecce, patriapalace.com/en/ is a 1-minute walk from the ornate Basilica di Santa Croce and 4 minutes on foot from 16th-century Castello Carlo V. This is a grand elegant hotel full of old charm and so, so Italian with refined, traditional bedrooms. They also provide a breakfast fit for royalty. After checking in we walk 50 yards to the old square and dine at a trattoria. Lecce is a riot of cherubs; the Baroque masterpiece of southern Italy. Sometimes described bt the locals as the ‘Florence of the Baroque’ or the ‘Rome of the South’. Lecce’s history goes back a long way – you can still see ruins of a Roman theatre and amphitheatre – but the period which led to town’s current fame was the 17th century. A period of prosperity led to grand developments and the wholesale construction of palaces and churches. These buildings adapted the fashionable Baroque style to the soft local stone, with decorations and cherubs extravagantly covering facades and doorways. This local style is known as barocco Leccese (‘Lecce Baroque’). There will be time available to further investigate the town before we leave the for a 90 minute drive to Locorotondo. We had searched many villages and dismissed many as being on the tourist route. We went there and were enchanted by the beautiful setting of this town. 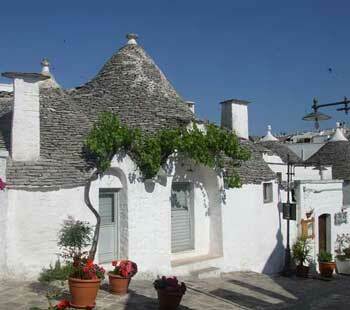 The town is perched on a hill top overlooking undulating slopes packed with crops, vines and more trulli. It is is officially one of the Borghi più belli d’Italia, the most beautiful villages in Italy. Although it has received this accolade, it is still a working living town. There are no hotels just apartments. We went in the middle of a storm and it was still attractive. We also saw for the first time a double rainbow. It is a walled village and has numerous bars and restaurants. As well as its picturesque appearance the town is also known for its wine production (especially whites). We check in to our apartments and meet for an early evening wine tour and tasting. There has been a huge investment in this winery and the contrast between the old Trulli farmhouse and the new cellars for storing the oak barrels is amazing. Then we go on to one of the fabulous restaurants in the centre of the old town. We then have an hour`s journey back to the airport for an evening return flight to Manchester and we stop for some light refreshment. As the only flights to Brindisi are on Monday and Fridays, this is a 5 day/4 night trip. Thus adding 1 extra night in a hotel and 2 extra meals. Coupled to this the devastating effect that Brexit has had on the exchange rate. In July 15 it was 1.43 euro to a pound it is now 1.13 which is a 20% drop in value. This trip will cost £1295.00. Bearing in mind, that this will include flights, transport, all meals and wines. There would be a £75 supplement for a single traveller. We would like a 25% deposit on booking and the balance 6 weeks before leaving. There is a short walk to a restaurant just outside the town walls. We have dined there and found the dishes and wines to be excellent. It is where the locals eat. On Thursday, there is another vineyard to visit, which they have modestly called Excelencia. This is a small winery, only 7 hectares but they strive to make wines that live up to their name. The vineyard was established in 2006 but there were plantings dating back to the Phoenicians. They sent soil samples off to viticulturists who declared that the soils and climate with modern grape training would be ideal for Cabernet Franc and Syrah with support from Tempranillo and Merlot. They are producing very classy wines. We return to our hotel for the last night and walk down to the square and dine at a small restaurant that is highly rated as being one of the best in the Costa del Sol. There is no menu. They cook what they have bought that morning. The food is excellent. On Friday we check out and then we drive for an hour to El Chorro and the famous Camanito del Rey. This walk is optional, but it is a most memorable scenic, almost 2 hour passage, through gorges, mountains and rivers . As keen walkers, we thought this walk was outstanding for its views and one of the best. Never to be forgotten. Those wishing to rest their legs can spend time taking in the views over the lake, maybe having a glass of wine. Later we would drive to the end of the walk. Should you be considering this trip we will advise you to book early as the hotels have limited number of rooms. Around midday on Tuesday we will arrive at Malaga airport and take you to our casa in the centre of Antequera. It is a short journey of under an hour and there we shall have a welcome lunch washed down with cava. We then set off for Jerez which is almost a three hour journey and we will have some rest stops on the way. Fortunately once in Jerez, there is very little driving. We shall have a few hours to rest or explore the historic centre of Jerez. That evening we will dine hopefully, al fresco, at Cruz Blanca, where we have had some fantastic meals. The location of this restaurant is very special. Sitting under the jacaranda trees, admiring some of Jerez`s oldest architecture. We can still remember the crispy ciabatta base covered with caramellised onions, topped with tangy goats cheese and sprinkled with walnuts then covered with a rich Pedro Ximinez sauce. Fantastic. There is also a full wine list to match their many dishes. The highlight of the last trip was a visit to the bodega of Jan Pettersen, Fernando de Castilla www.fernandodecastilla.com. One of the most exceptional of the small, independent sherry houses, Fernando de Castilla was revitalised in 1999 by Jan Pettersen – a Norwegian with a passion for top quality sherry, and 15 years experience at Osborne. After taking over the cellars of the Sherry shipper Jose Bustamante, located next door to the main facilities of Fernando de Castilla, Jan quickly established Fernando de Castilla as masters of the production and ageing of fine, unblended, untreated Sherries. The bodega’s reputation is based on the excellence of the Antique range of intensely pure and complex single solera Sherries . His bodega has gone from strength to strength and has now surpassed famous brands such as Lustau and especially Tio Pepe. Equally as impressive was fantastic tapas to match his sherries, in an exquisite authentic dining room. We set off for another bodega but this one specialises in red wine, Bodega Luis Perez http://bodegasluisperez.com. The grape varieties , i.e., Syrah, Petit Verdot, Merlot, Tempranillo, Cabernet Sauvignon and Tintilla are grown at Vistahermosa Hacienda, which is on one of the highest points in the area and 13km off the coast. Sea winds moderate the temperature .This is a modern winery and breaking with tradition by making red wines instead of sherry. We will taste the wines and have tapas with views of the undulating hills . That evening we go to a gastrobar in Jerez with a fantastic wine list. Located down a narrow pedestrian lane in the old town They have taken tapas to new heights and dishes that impressed us were. Tuna and salmon in a teriyaki sauce with green figs also Chicken breast stuffed with black chocolate and plums with orange and reduction of jerez brandy sauce The food is beautifully presented as you can see from the picture. We then set off for Malaga which is only an hour away for the flight back to Manchester. You will have noticed that this is quite the foodie trip with excellent restaurants serving fine food and wines. This 4 day, 3 night trip includes the cost of flights, minibus use, all meals and wines. We fly on an evening flight to Bilbao. We shall stay at a nearby hotel in the delightful sounding town, Loiu. The hotel is named after the town and has a good restaurant and an excellent range of local wines. The staff are so friendly and courteous, which makes the stay here very pleasant. We will have a light supper after checking in. We leave the hotel for a 90 minute journey to Burgos, stopping for lunch in the easy to pronounce Cuzcurrita de Rio Tiron. This very small village is on the western edge of the Rioja region. We have picked a high class restaurant that specialises in the local cuisine. It also has the great advantage of a dining terrace leading down to the river Tiron. They also have a connection with the local winery and it seems a good idea that we should taste these wines. Suitably fortified we have an hour`s journey to Burgos. We have found this town to be breathtakingly picturesque and cannot wait to return. The extraordinary Gothic cathedral of Burgos is one of Spain‘s glittering jewels of religious architecture and looms large over the city and skyline. On the surface, conservative Burgos seems to embody all the stereo­types of a north-central Spanish town, with sombre grey-stone architecture, the fortifying cuisine of the high meseta (plateau) and a climate of extremes. But this is a city that rewards deeper exploration: below the surface lie good restaurants and, when the sun’s shining, pretty street scenes that extend far beyond the landmark cathedral. During your stay, you will have time to stroll along the river and soak in the charming understated atmosphere of this most attractive city. There’s even a whiff of legend about the place: beneath the majestic spires of the cathedral lies Burgos’ favourite and most roguish son, El Cid. We will check in at Meson el Cid. This is next to the magnificent cathedral. Having had time to explore the old town, we dine at a restaurant that they reckon produces finer tapas than can be found in San Sebastian. Those with abundant energy can stay in this area with the numerous bars and busy street life. After breakfast, we have a short journey to the main reason for coming here. The winery is extraordinary. The tour is unbelievable. It is not the standard winery. We do not want to spoil your visit to this winery by revealing the hidden surprising feature. They are a small family concern who practically do everything in the vineyard. They are so helpful and proud of their wines and winery. Bodegas Ismael Arroyo, which is located south of Burgos in Ribera del Duero. The village called Sotillo de la Ribera, placed in a picturesque valley in the heart of the Denomination of Origin Ribera del Duero. The tradition of winemaking has been passed down from generation to generation in the family of Ismael Arroyo for 400 years. ValSotillo Reserva 2009 y ValSotillo Finca Buenavista 2012have been selected by The Wine Gang as two of the best 50 wines from Ribera del Duero. Tom Cannavan, Jane Parkinson, Ant Rose, Jo Simon y David Williams, are five of the most experienced and respected wine critics in the UK. They came in September 14 to visit Ribera del Duero región and took part in a blind tasting of 120 wines. In the evening we go to the busiest bar/restaurant in the town. It heaves with people who are enjoying the simple things in life Drinking. Eating and talking (sometimes all at once). The atmosphere buzzes. We leave the hotel for a 2 hour dive to a place near to the airport. Larrabetzu is the home to 2 grand restaurants. We are going to Pret a Porter which is the junior restaurant of Azurmendi, a 3 star Michelin restaurant which is ranked as the 28th best restaurant in the world. The other restaurant (Pret a Porter) is modern and sophisticated and holds a Michelin Bib Gourmand. This is 12 minutes from the airport and we leave there for the afternoon flight to Manchester. The cost of this trip will be £795.00. There would be a £95 supplement for a single traveller. We would like a 25% deposit on booking and the balance 6 weeks before leaving. Verona is one of Italy’s loveliest towns. It has charm, panache and elegance. This has been a thriving and successful town for most of its history, and today smart shops and cafes fill the attractive medieval lanes of the historic centre. There’s a lot to see here, from Roman ruins to the so-called ‘Juliet’s balcony’. The restaurants are pretty good as well and the wines… Fantastic. The only thing missing on this trip is George Clooney. In the morning we set off to visit one of Soave`s finest vineyards Pra. This is a small family run business. This 20 hectare estate in the commune of Monteforte D’Alpone in the very heart of the Soave Classico district is run by Graziano Pra. Universally regarded as one of a handful of world-class producers in Soave who have revitalised the region. The wines have won many awards with the most celebrated is the opulent Monte Grande, awarded ‘Tre Bicchieri’ 5 years in a row. In 2006 Graziano produced his first red wine from the Morandina vineyard in eastern Valpolicella, in the foothills of Monte Lessini. The Valpolicella was soon followed by an Amarone. The vineyard, 450 m above sea level, had never previously been cultivated – and is not treated with any chemicals. He has some of the best sites for his wine and pictured is the steeply sloping Monteforte vineyard. We will have a tour of the vineyards and then taste his wines. The winery is also his home and the setting is beautiful and tranquil. We envied Graziano in the evenings sitting on the veranda, soaking up the fantastic scenery and relaxing. We then drive to Soave and this medieval village is stunning. The castle at the top of the hill dominates the pretty village. And we will lunch in the finest restaurant in Soave. It is just inside the gate and southern-western walls of Soave. Again it is well used by the locals and from the conversations around us and the hellos to dinners and those strolling past, we were the only tourists. We have a short 10 minute journey to the winery and offices of Montresor. The Montresor family has its roots in France. In the sixteenth century, a branch of the family moved from Château Montresor, in the Loire valley, to Verona, Italy. There, they acquired lands, estates, and started the culture of the vines. When Giacomo Montresor, in the second half of the 19th century, started to sell the wines he produced under his family name. Today, his successors carry on this tradition which associates the agricultural activity to selecting, aging, bottling, and distributing operations. The Montresor family is mentioned in the famous tale of Edgar A. Poe, “The Amontillado Cask”, where a member of the Montresor family is described as premium wine connoisseur with an excellent palate. The estate wines, from 100 ha of vineyards in Valpolicella and Garda, offer remarkable value for money, particularly the Capitel della Crosara vineyard near Negrar which produces fine, richly-flavoured Ripasso and a generous, classically-styled Amarone with great concentration and texture. The host Victoria, a larger than life character, who although from Naples, is so proud and passionate about her wines. She is unbelievably so proud of her work and winery! We return to the hotel and again there will be a few free hours. That evening we dine in the oldest restaurant in Verona. This is one of the oldest taverns in town, established in 1890 – though there was an inn on the site as early as the 16th century. With a cellar the stuff of legend containing thousands of bottles of fine wine, and good, home-cooked traditional fare from the kitchen, for well over a century The food was excellent, simple but so flavoursome, The wine list is unbelievable all 185 pages. We leave the hotel for Franciacorta which is near Lake Iseo. It is sandwiched between the larger and better known lakes Garda and Como. Franciacorta is a region of Lombardy and is the generic name for their sparkling wines. Aptly made near the fashion mecca of Milan in Lombardy, Franciacorta was Italy’s first wine to be produced in the classic “champagne” method of second fermentation in the bottle. A long ageing on the lees (yeast sediment) in the bottle imbues it with more richness, creaminess and complexity than simpler tank-fermented sparklers (such as prosecco). We will visit the winery of Ferghettina which was founded by the cellarmaster Roberto Gatti. He is assisted by his daughter Laura, also an oenologist. The Gatti’s control production of Chardonnay and Pinot Noir, using only half of the grapes available for their production of 300,000 bottles. Meticulous attention to detail, skillful blending and long bottle maturation give wines of great finesse and individuality. The ‘Italy’s answer to Champagne’ tag is unavoidable but these wines are much more than that. Reluctantly we head back to Bergamo for the tea time flight back to Manchester. This 4 day, 3 night trip includes the cost of flights, transport, all meals and wines. We have worked on the basis of 2 people sharing a bottle of wine with their meal (lunch and dinner). Airline charges vary but approximately it would be an extra £40 for taking a suitcase (15kg) in the hold, so we have worked on hand luggage only. The cost of this trip will be £895.00. Bearing in mind that this covers flights, transport, all meals and wines. There would be a £95 supplement for a single traveller. We would like a 25% deposit on booking and the balance 6 weeks before leaving. San Sebastian occupies a bay formed by the mountainous Cantabrian coastline. The Sacred Heart statue on Monte Urgull (statue of god), the bay’s eastern headland, towers over the Parte Vieja . This district of narrow streets is the main hub, squeezed between the mellow La Concha beach to the west and the mouth of the Urumea river as it flows into the Bay of Biscay. The food and wine is so different from the rest of Spain. The local wine is Txakoli, a young white wine typical of the Basque Country, is served extremely cold and poured from a height to force fizz into the liquid. It’s deliciously acidic. We leave Manchester early morning, arriving at Bilbao airport just after 11am then we drive for 90 minutes to San Sebastian. The journey is magnificent. An array of mountains and forests that rivals Scotland. For our lunch, we will have an introduction to the unique tapas of San Sebastian or as they call them pintxos. With pintxos, the idea is to eat one or two of what each bar does best, before moving on. Ask at the bar for crockery and you’ll get plates the size of car tyres. Don’t feel self-conscious when taking only one. The perfect pintxo should have exquisite taste, texture and appearance, and should be savoured in two elegant bites; it transcends the commonplace by the sheer panache of its culinary campness. In San Sebastián especially, Basque chefs have refined the pintxo to an art form. After lunch, there is a choice of resting , swimming ,as the beach is only 2 minutes away, shopping or check out the numerous bars in the old town. In the evening we will explorthe 2 exciting streets of Parte Vieja, – Fermin Calbeton and Treinta de una Agosto .We will dine in Gandarias restaurant, having a full traditional Spanish meal with a vast array of wines. We have enthused over the wines from Senorio de Sarria for many a year. When we went to the winery it was even more impressive. We arrive at the main entrance and it then took another 15 minutes driving to arrive at the winery. This estate is on the same scale as Lyme Park but with sunshine! The home as you can see is quite impressive. Equally so is the bodega. It is spotless and the wines are fantastic. They also have a top class restaurant which offers lunch with some of their wines. We return to San Sebastian for an evening of pintxos. We have a relaxing day in San Sebastian . Whether you want to go and see God in the hills (ask Pauline about this). Or gaze at the sand etchings, walk the magnificent promenade . At lunch we will have a tapas crawl. Going from bar to bar sampling their best tapas. This 4 day, 3 night trip includes the cost of flights, minibus use, all meals and wines. We have worked on the basis of 2 people sharing a bottle of wine with their meal (lunch and dinner). Airline charges vary but approximately it would be an extra £30 for taking a suitcase in the hold, so we have worked on hand luggage only. The cost of this trip will be £750.00. Bearing in mind that this covers flights, transport, all meals bar one and wines. There would be a £95 supplement for a single traveler. We would like a 25% deposit on booking and the balance 6 weeks before leaving. Spain’s third-largest city is a magnificent place. It is content for Madrid and Barcelona to grab the headlines while it gets on with being a wonderfully liveable city with thriving cultural and gastronomic scenes. Never afraid to innovate, Valencia diverted its flood-prone river to the outskirts of town and converted the former riverbed into a wonderful green ribbon of park winding right through the city. This trip is based on the city of Valencia and apart from a 6 mile journey to Lake Albufera there will be little driving. We fly on a late afternoon flight on Monday arriving in Valencia at 20.30. A short taxi journey to the hotel and we dine locally. We have found an elegant hotel, which is situated in an impressive, 18th-century palace in the centre of Valencia, 200 metres from the Cathedral. It has an historic facade, with a classic continental interior of noble woods and marble. It is surrounded by other prestigious buildings, such as the Palace of the Dukes of Cardon. Nearby is a fabulous house housing a vast collection of ceramics, Palacio de Dos Aguas, which we will visit. The old town is very compact and we are near to the cathedral (top picture). It was built over the mosque after the 1238 reconquest.. Left of the main portal is the entrance to the Miguelete bell tower, if you are feeling energetic. Climb the 207 steps of its spiral staircase for terrific 360-degree, city-and-skyline views. Besides the obvious places, others worth mentioning are……. L’Iber Museo de Los Soldaditos de Plomo. The collection of lead figures – mainly military – is housed in a beautiful mansion with a glorious courtyard at its entrance. After breakfast at the hotel, this is the day to explore Valencia. We will provide maps and suggestions and then meet up for lunch in the old city. We will have drinks at Cafe Sant Jaume, it used to be an old apothecary, but now serves better remedies? We then lunch at Tinto Fino Ultramarino . (http://www.tintofinoultramarino.com/en/) where we will have a tasting of the local wines. elegance and the food matches. La Carme (http://lacarmerestaurant.blogspot.co.uk/) is a contrast to the bustling local scene. We visit the market for breakfast. We can definitely say that this will be your best breakfast experience. Valencia’s Mercado Central is the largest market in Europe. It covers a huge 8,000 square metres and contains almost 1,5000 food stalls. This is a great place to head to discover a genuinely local Valencia. You can walk amongst the food stalls selling everything from fresh fish to olive oils, local cheeses to cured meats. We bought some fine jamon and tons of dried fruit besides wine, saffron, pimiento etc. It is more than a match for Barceona`s market, La Boqueria. To carry on with the traditional theme we lunch by the port in what used to be a fisherman`s inn. It`s a short taxi ride to almost another world. Casa Montana (www.emilianobodega.com) is a real legend in Valencia and affluent clientele comes to this neighbourhood from all over Valencia just to have those tapas. A classy wine cellar interior with professional service, giving you a range of tapas which, while being mostly classical, somehow also manage to be unique to this place. Casa Montana spreads its personality over those tapas, and a part of the taste experience comes from the very special attention to the quality of ingredients. In the evening we try a Michelin rated restaurant Mar d’Avellanes Restaurant (http://mardeavellanas.com) which we found wandering through the alleys and back streets, this cute restaurant offers excellent food. We visit the Palacio de Dos Aguas. We know you will find this a vastly enjoyable .experience .Picture below shows the freeze above the main door. We then follow this with the pride and joy of Valencia, Paella. The Moors introduced rice to the city, paving the way for what soon became Valencia’s signature dish, and the hallmark of Spanish cuisine around the world. It’s a feast for the senses. The taxi journey to 6 miles south of Valencia takes us through Albufera national park. It is home to the largest lake in Spain and one of the most important wetland areas in the Iberian Peninsula.. Its waters have been traditionally worked by fishermen and rice growers, supplying ingredients and inspiration for many of the regions most succulent dishes. Valencians are pernickety when it comes to paella we have to say that the L’Establiment is the best restaurant to visit if you want to taste an authentic Valencian paella. The restaurant is a hidden gem located in the rice fields and the road leading to the restaurant is a treat in itself. We sat gazing out on to the rice fields and you could imagine the rice growing. Paella is the only main course served and it takes around 40 minutes for it to be cooked. They are so proud of the finished dish and they bring it to the table still in its paella pan. That evening we dine at Jacaranda (http://jacarandasensationfood.com/). In short: wonderful food, great service, staff passionate about food, they are o friendly and helpful, accommodate allergy requests well and there’s a good atmosphere. We check out of the hotel for a 14.25 return flight to Manchester, so there will be a little time for last minute purchases. This 5 day, 4 night trip includes the cost of flights, transport, all meals and wines. We have worked on the basis of 2 people sharing a bottle of wine with their meal (lunch and dinner). Airline charges vary but approximately it would be an extra £30 for taking a suitcase (15kg) in the hold, so we have worked on hand luggage only. The cost of this trip will be £850.00. Recently we took a group to Antequera and when they left, to celebrate John`s birthday we drove to the Alpujarras. This region was stunning from snow on the mountainous skyline to charming villages. The hospitality and warmth of the people was outstanding. We realised that it was scenes from the book “Driving over Lemons” We knew that this will make a perfect trip. We will as usual fly to Malaga where we pick you up and take you to our house in Antequera for the welcome lunch. Then we drive to Granada and stay in the the Hotel Macia Plaza for one evening. This is very convenient for the Albaicin and Alhambra. The region of mountain villages known as Las Alpujarras clings to the southern flanks of the Sierra Nevada, sheltered valleys and gorges which run down towards the Mediterranean. The cultural interest of the region lies in its fifty-odd villages, which were the last stronghold of the Spanish Muslims, or Moors. We narrowed it down to 3 villages, all close together that we know are the prettiest villages of the area. These unique hamlets have retained their traditional Berber architecture – terraced clusters of grey-white box-shaped houses with flat clay roofs – which is still common in the Rif and Atlas mountains of Morocco. Driving through this unspoilt mountainous region with its striking and dramatic views is breath taking. See http://www.andalucia.com/villages/alpujarras.htm for more details. The most picturesque villages are the famous trio which cling, one close above the other, to the slopes of the Poqueira Valley, where red peppers and tomatoes are still set out to dry on the flat clay roofs, among the tall round chimney pots. Pampaneira, at the bottom, bustles with craft shops and restaurants, as does Bubion, half way up the slope, with its massive square church tower standing on a plaza of rough paving stones. But to savour the authentic Alpujarra, go to Capileira at the top of the valley – the name is an Arabic derivation of the Latin word for head or top – and walk down from the road into the lower streets of the village, where the rocky streets, overhanging passageways and sagging, stone houses have still not been remodelled and prettified for contemporary living. There are lovely artisan shops offering local wine and food as above. This peaceful place has a range of individual shops ranging from locally made leather goods, glassware to weaving. Some still using silk as the Moors planted mulberry trees some 700 years ago. The culture and history of this valley is unique. The views of the stunning countryside create a rustic, tranquil haven for visitors. The villagers lead a simple lifestyle but it is enviable. We plan to leave early Tuesday morning arriving at Malaga before midday and then having an hours drive to a chiringuito on the sea front. These buildings on the beach specialise in fresh fish. This may be the only opportunity to sample fish for the next few days. Then we start climbing up the foothills of the Sierra Nevada until we reach Capileira. We will stay at the Hotel Real de Poqueira, http://www.hotelpoqueira.com for the 2 nights. This new hotel is stylish, contemporary and centrally located. We sampled the excellent food there and we shall dine there. The next day we envisage a walk downhill stopping at Bubion for a little exploration and maybe some refreshment. Bubion offers amazing views of the other 2 villages. We carry on walking to Pampaneira where we shall visit the local deli. There we shall try the local wine ham and cheese. This deli is extremely popular with the locals and is their meeting point. The range of food and wines made our mouths water. The produce that we will eat and drink will definitely make want you purchase the cheeses, jamons, wines, honey etc from here. The walk is around 90 minutes but those preferring an easier lifestyle can take the bus. We will all return on the bus. Good shoes or trainers are needed and if you have them walking poles would be helpful. That night we return to Capileira and dine at a restaurant that affords view of the scenic walk that we enjoyed earler. The day after that we take the short journey to Trevelez. This village is famous for its hams (jamon). Wherever you go you will be surrounded by hams suspended from the ceiling. We will visit museum of jamon. We tested some of the jamons and cheeseswhich were so tasty. This resulted in a small mountain to be brought to the UK. Suitcases will be needed and we have included a suitcase to be taken in the hold besides the hand luggage. We drive to Pampaneira for a late afternoon meal which we plan to have outside on a rooftop terrace. The mountainous views from the terrace again are compelling and tempts people to live there. Friday morning we will have time to shop or have a leisurely stroll around the village before we head off for Malaga, where shall lunch on the seafront. We return on an evening flight. As you can see, our all-inclusive guided tours are ideal for single, couples, small groups of older people / pensioners / retirees. We are leaving Manchester on an early morning flight, courtesy of Lufthansa via Munich arriving at Turin 12.10 local time. Even with stopping at Munich this is much quicker than the slog from north east Milan, unfortunately it is slightly more expensive. We then have an hour‘s drive to La Morra which offers great picturesque views of the rolling countryside featuring Barolo and Barbaresco. La Morra is the centre of growing Nebbiolo. Years ago it was illegal in La Morra to cut down a Nebbiolo vine. The penalty for this offence ranged from a fine, to having a hand amputated to hanging. This will give you the first impression of the undulating vine packed slopes. Its incredible. We will dine outside on the terrace sampling some of the local wines. There is an accusation that Italy does not export its best wines. Well the wines are well priced and impressive but the food we had a selection of anti pasta dishes that ere a revelation. Suitably refreshed we roll downhill to Barbaresco country. We shall dine in their restaurant on both nights. The restaurant even mid -week is packed with locals and no wonder. The setting is unique and to be on the restaurant terrace (pictured) in the evening is an incredible atmospheric experience that words do not do justice. The restaurant , wine shop and bedrooms are on the top of a range of hills called Il Cascinone. They have been restoring these vineyards for the last 10+ years. The views from our bedrooms of the vines that cascade around the undulating hills are so peaceful and relaxing. It is almost a wrench to leave here to descend into the valley to tour the main winery. Although they produce a high volume of wine, they are extremely meticulous in their attitude to their winemaking. Nothing is left to chance. Bottles are tested by pressurising with an inert gas (a broken bottle on the bottling line causes chaos- stopping to remove shards of glass and the delay in bottling). Corks are tested besides the wines being constantly checked. In the afternoon we shall call in at the nearby thermal spa town Acqui Terme where we will lunch and just maybe try some more wine. Acqui was founded by the Romans 2150 years ago and then it became a market trading town.It is steeped in history . It is well off the beaten track and no English is spoken. The old buildings from cathedrals, aqueducts combine with the narrow cobbled streets to make this a most memorable town. We dine in a local brasserie that is described as one of the best in Piemonte. On Thursday , after breakfast we drive to nearby Alba (45 minutes) and visit a very friendly winery Poderi di Colla. This family run business simply want to make the best wines that they can. Their enthusiasm and drive is incredible. Their wines are great. We shall have a tasting and a light lunch after looking at the vineyard. Beppe Colla (born in 1930),is the definitive authority on the Langhe appellations. Beppe was one of the founding fathers of the Alba DOCs in the 1960s, and is said to know every vine in every vineyard around Alba! Beppe’s daughter, Federica now runs the business with her uncle , Tino (pictured left) and now his son Pietro, who graduated from oenology at Turin University in 2006 and is now very active in the vineyards. They make 150,000 of very high quality wine a year and specialise in Nebbiolo with some Dolcetto and Pinot Noir. They also make a dry Riesling capable of good aging. Their flagship wine is Barolo Bussia, Dardi le Rose and this is gorgeous and sells for around £30 a bottle. We then have a short drive to Alba where we stay at hotel San Lorenzo. It is based in the old town, behind the cathedral. In the gastronomic heaven that is Italy, Alba is a leading player courtesy of its black truffles, dark chocolate and wine. Eschewing the modern penchant for junk food, this once-powerful city-state has redirected its energy into showcasing the fine art of real cooking, with ingredients plucked from within spear-throwing distance of your restaurant table. On top of this Alba is a charming authentic town. We have selected a restaurant or osteria (pictured right) as they call them, that is charming and rustic. It is always busy. The dishes are good as are the wines. The owner even blends his own wine. It is well loved by all the surrounding winemakers. The return flight leaves at 19.45 so we have to be at Turin airport by 17.45. It lands at Manchester at 22.50. The cost of this trip will £795.00 bearing in mind that this will include all flights, transport, meals and wines. There would be a £95 supplement for a single traveller. We would like a 25% deposit on booking and the balance 6 weeks before leaving. We expect demand to be high for these trips and suggest that you book as early as possible. Also there is a limited number of bedrooms at Il Cascinone. We loved this trip and think you will! This trip could be compared with the 3 bears. We will visit 3 different wineries of contrasting size and regions. One winery is achieving cult status and another produces wine that Robert Parker has said that he thinks “it is probably the best value red wine in the world”. Besides the wines there are restaurants galore and fabulous scenery. We fly on an evening flight to Bilbao where we shall stay at a nearby hotel in the delightful sounding town Loiu. The hotel is named after the town and has a good restaurant and an excellent range of local wines. In the morning we have an 80 minute drive to Haro where we visit the multi award winning Rioja bodega Valenciso. This is a very small boutique bodega. Valenciso, created in 1998, seek to make classically structured, subtle and elegantly fine wines using 100% Tempranillo grapes from low yielding old vines in the Rioja Alta. Winemaker Alicia Eyaralar uses exclusively French barriques, a third being new each year, to produce this great wine in very small quantities. They make 1 white and 1 red wine. The latter is really soft with a depth of flavour and the classic combination of ripe red berry fruit, cedary oak and smooth, fine tannins. Very elegant, subtle and classically structured. We lunch in the village near to the winery. Then drive to Tarazona, an old fashioned town that is re-discovering its glory days, pictured is the town hall. Tarazona is the fourth city in the Zaragoza region. It is situated at the foot of the Moncayo mountain and at a crossroads of Aragón, Navarra, Castilla y Leon and La Rioja. Tarazona is an episcopal and Mudejar city. Its cathedral is one of the most unusual of the nine in Aragón, since added to the original Gothic structure are Mudejar towers and a dome base, as well as a Renaissance façade. Tarazona also has a polygonal bullring from the 18th century formed by houses which are still lived in today , We have found a hotel, that is a delight. La Merced de la Concordia http://www.lamerced.info is very central for bars the old town and walking down to the river and the cathedral. We then have short drive to the outskirts of Zaragoza and have lunch at a new restaurant that is gaining plaudits all the time. We will drink wines that were produced in the bodega. Then a very short journey to the centre of Zaragoza, where we will stay at the Hotel Oriente http://www.hotel-oriente.com. This hotel is right next to the old quarter of the town, where we will dine. Nearby is the Plaza del Pilar Square, alongside the Ebro River. Here you will find three of the city’s emblematic buildings: The Pilar Basilica, church and universal symbol of Zaragoza; La Lonja Palace, the region of Aragon’s most important 16th century civil building, venue for many exhibitions throughout the year; San Salvador Cathedral (the “Seo”), Aragon’s most valuable and significant monument, where you will find medieval artistic styles reflected, along with Renaissance and Baroque elements. Be sure to look at the exterior wall of the Parroquieta Chapel, on one side of the Seo – it is the pinnacle of Zaragoza Mudejar architecture. In the morning we drive to the third winery Castell del Remei .It is is one of the great Catalan wine producers. Located at 300 metres above sea-level, about 120km to the west of Barcelona, its vineyards enjoy a semicontinental climate, granitic soils and a three century history which is closely linked to that of leading Catalan dynasties. The people at the winery are so helpful and willing to please. The owners have invested heavily in the property and are slowly restoring all the buildings. They have a passion for art and stage many exhibtions of sculptures and paintings. Originally the vines used were French so there is a concentration of Sauvignon blanc, Chardonnay, Merlot and Cabernet sauvignon to which they have added the native graped of Viura , Tempranillo and Grenache. They have an unusual option of making each variety dominant with support from some other varieties. Their top wine 1780 is mainly Cabernet Sauvignon with a dash of Tempranillo and Garnacha. There is a remarkable restaurant that has received great reviews. We shall dine there and have the opportunity to re taste the wines. After our sumptuous afternoon we travel a short distance to Montblanc (not the one in the Alps). We have located a great small hotel, The “Fonda dels Àngels”, a building dated between XIII and XIV centuries, it is placed in the centre of the old town quarter within the walls of Montblanc. Montblanc is inland from Tarragona, a port about 60 miles south of Barcelona. Sights include the medieval walled village of Montblanc and to the Poblet Monastery, a UNESCO World Heritage site. Saturday morning we leave for Barcelona airport, where we will take the midday flight to Manchester.